2Prof. Dr., İstanbul Üniversitesi İstanbul Tıp Fakültesi, Göz Hastalıkları ABD, İstanbul, Türkiye Purpose: To evaluate the changes in choroidal vascular index (CVI) after low fl uence photodynamic theraphy (PDT) in central serous chorioretinopathy (CSC). Materials and Methods: Patients with a complaint of longer than 6 months with the diagnosis of CSC and who has done low fl uence PDT was reviewed retrospectively. Patients with enhanced depth imaging (EDI) - optical coherence tomography (OCT) images before and after treatment were included in the study. 1500 μm subfoveal area evaluated after segmentation. 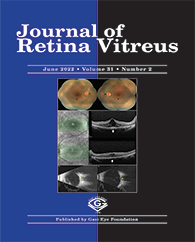 CVI was defi ned as ratio of lumen area (LA) to total choroidal area (TCA) according to EDI-OCT images. Results: Twenty-three eyes of 19 patients were included in the study. The mean age was 43.21 ± 7.4, and 10 (52.6%) of the patients were male. Choroidal vascular index was 65.4% before treatment, 64.82% at 1 week, 62.42% at 1 month, and 62.97% at 6 months after treatment. A signifi cant decrease in choroidal vascular indecency was detected at 1 month and 6 months after treatment compared with before treatment (p<0.05). The pre-treatment subfoveal choroidal thickness was 457.65 ± 108.15 μm; 443,30 ± 108,38 μm in the 1. week, 416,60 ± 89,71 μm in the 1. month and 411,47 ± 101,29 μm in the 6. month. All choroidal thickness measurements after treatment were signifi cantly lower than before treatment (p <0.05).